Terms of Service and Use Welcome to ANY LAB TEST NOW®. We’re proud to offer thousands of comprehensive lab testing services. • You agree that any lab test purchased from ANY LAB TEST NOW® is for informational and educational purposes only, and does not constitute medical advice, diagnosis or treatment in any way. • You release and hold harmless the Company from any injury or personal damage that occurs while you are on Patient Service Center (PSC) premises. • You agree to not violate the copyright protection of all images, text, audio, video and animations on this Site. • You agree to not use this Site for illegal purposes. • We do not warrant the accuracy or completeness of the information, text, graphics, audio, video, animations, links or other items contained on the Site. Any of the information offered on the Site may change at any time without notice. Disclaimer ANY LAB TEST NOW® was created so everyone can have access to affordable, confidential and Anonymous Lab testing. Our laboratories are CLIA-certified at the federal level, so you can be confident you’re receiving the same high quality tests a doctor or hospital would provide. The information provided by ANY LAB TEST NOW® is for educational purposes only and is not intended for diagnosis. 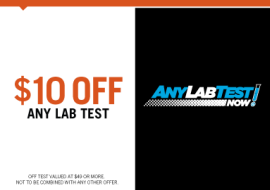 NO UNLAWFUL OR PROHIBITED USE As a condition of your use of the ANY LAB TEST NOW® Web Site, you warrant to ANY LAB TEST NOW® that you will not use the ANY LAB TEST NOW® Web Site for any purpose that is unlawful or prohibited by these terms, conditions, and notices. You may not use the ANY LAB TEST NOW® Web Site in any manner which could damage, disable, overburden, or impair the ANY LAB TEST NOW® Web Site or interfere with any other party’s use and enjoyment of the ANY LAB TEST NOW® Web Site. You may not obtain or attempt to obtain any materials or information through any means not intentionally made available or provided for through the ANY LAB TEST NOW® Web Sites. LIABILITY DISCLAIMER THE INFORMATION, SOFTWARE, PRODUCTS, AND SERVICES INCLUDED IN OR AVAILABLE THROUGH THE ANY LAB TEST NOW® WEB SITE MAY INCLUDE INACCURACIES OR TYPOGRAPHICAL ERRORS. CHANGES ARE PERIODICALLY ADDED TO THE INFORMATION HEREIN. Any Lab Test Now® AND/OR ITS SUPPLIERS MAY MAKE IMPROVEMENTS AND/OR CHANGES IN THE ANY LAB TEST NOW® WEB SITE AT ANY TIME. ADVICE RECEIVED VIA THE ANY LAB TEST NOW® WEB SITE SHOULD NOT BE RELIED UPON FOR PERSONAL, MEDICAL, LEGAL OR FINANCIAL DECISIONS AND YOU SHOULD CONSULT AN APPROPRIATE PROFESSIONAL FOR SPECIFIC ADVICE TAILORED TO YOUR SITUATION. Any Lab Test Now® AND/OR ITS SUPPLIERS MAKE NO REPRESENTATIONS ABOUT THE SUITABILITY, RELIABILITY, AVAILABILITY, TIMELINESS, AND ACCURACY OF THE INFORMATION, SOFTWARE, PRODUCTS, SERVICES AND RELATED GRAPHICS CONTAINED ON THE ANY LAB TEST NOW® WEB SITE FOR ANY PURPOSE. TO THE MAXIMUM EXTENT PERMITTED BY APPLICABLE LAW, ALL SUCH INFORMATION, SOFTWARE, PRODUCTS, SERVICES AND RELATED GRAPHICS ARE PROVIDED “AS IS” WITHOUT WARRANTY OR CONDITION OF ANY KIND. Any Lab Test Now® AND/OR ITS SUPPLIERS HEREBY DISCLAIM ALL WARRANTIES AND CONDITIONS WITH REGARD TO THIS INFORMATION, SOFTWARE, PRODUCTS, SERVICES AND RELATED GRAPHICS, INCLUDING ALL IMPLIED WARRANTIES OR CONDITIONS OF MERCHANTABILITY, FITNESS FOR A PARTICULAR PURPOSE, TITLE AND NON-INFRINGEMENT. TO THE MAXIMUM EXTENT PERMITTED BY APPLICABLE LAW, IN NO EVENT SHALL ANY LAB TEST NOW® AND/OR ITS SUPPLIERS BE LIABLE FOR ANY DIRECT, INDIRECT, PUNITIVE, INCIDENTAL, SPECIAL, CONSEQUENTIAL DAMAGES OR ANY DAMAGES WHATSOEVER INCLUDING, WITHOUT LIMITATION, DAMAGES FOR LOSS OF USE, DATA OR PROFITS, ARISING OUT OF OR IN ANY WAY CONNECTED WITH THE USE OR PERFORMANCE OF THE ANY LAB TEST NOW® WEB SITE, WITH THE DELAY OR INABILITY TO USE THE ANY LAB TEST NOW® WEB SITE OR RELATED SERVICES, THE PROVISION OF OR FAILURE TO PROVIDE SERVICES, OR FOR ANY INFORMATION, SOFTWARE, PRODUCTS, SERVICES AND RELATED GRAPHICS OBTAINED THROUGH THE ANY LAB TEST NOW® WEB SITE, OR OTHERWISE ARISING OUT OF THE USE OF THE ANY LAB TEST NOW® WEB SITE, WHETHER BASED ON CONTRACT, TORT, NEGLIGENCE, STRICT LIABILITY OR OTHERWISE, EVEN IF ANY LAB TEST NOW® OR ANY OF ITS SUPPLIERS HAS BEEN ADVISED OF THE POSSIBILITY OF DAMAGES. TERMINATION/ACCESS RESTRICTION ANY LAB TEST NOW® reserves the right, in its sole discretion, to terminate your access to the ANY LAB TEST NOW® Web Site and the related services or any portion thereof at any time, without notice. GENERAL To the maximum extent permitted by law, this agreement is governed by the laws of the State of Washington, U.S.A. and you hereby consent to the exclusive jurisdiction and venue of courts in King County, Washington, U.S.A. in all disputes arising out of or relating to the use of the ANY LAB TEST NOW® Web Site. Use of the ANY LAB TEST NOW® Web Site is unauthorized in any jurisdiction that does not give effect to all provisions of these terms and conditions, including without limitation this paragraph. Any Lab Test Now®’s performance of this agreement is subject to existing laws and legal process, and nothing contained in this agreement is in derogation of Any Lab Test Now®’s right to comply with governmental, court and law enforcement requests or requirements relating to your use of the ANY LAB TEST NOW® Web Site or information provided to or gathered by ANY LAB TEST NOW® with respect to such use. Unless otherwise specified herein, this agreement constitutes the entire agreement between the user and ANY LAB TEST NOW® with respect to the ANY LAB TEST NOW® Web Site and it supersedes all prior or contemporaneous communications and proposals, whether electronic, oral or written, between the user and ANY LAB TEST NOW® with respect to the ANY LAB TEST NOW® Web Site. A printed version of this agreement and of any notice given in electronic form shall be admissible in judicial or administrative proceedings based upon or relating to this agreement to the same extent an d subject to the same conditions as other business documents and records originally generated and maintained in printed form. It is the express wish to the parties that this agreement and all related documents be drawn up in English. TRADEMARKS The names of actual companies and products mentioned herein may be the trademarks of their respective owners. The example companies, organizations, products, people and events depicted herein are fictitious. No association with any real company, organization, product, person, or event is intended or should be inferred. Any rights not expressly granted herein are reserved. LINKS TO THIRD PARTY SITES The ANY LAB TEST NOW® Web Site may contain links to other Web Sites (“Linked Sites”). The Linked Sites are not under the control of ANY LAB TEST NOW® and ANY LAB TEST NOW® is not responsible for the contents of any Linked Site, including without limitation any link contained in a Linked Site, or any changes or updates to a Linked Site. Any Lab Test Now® is not responsible for webcasting or any other form of transmission received from any Linked Site. Any Lab Test Now® is providing these links to you only as a convenience, and the inclusion of any link does not imply endorsement by ANY LAB TEST NOW® of the site or any association with its operators. AGREEMENT BETWEEN USER AND ANY LAB TEST NOW® The ANY LAB TEST NOW® Web Site is comprised of various Web pages operated by ANY LAB TEST NOW®. The ANY LAB TEST NOW® Web Site is offered to you conditioned on your acceptance without modification of the terms, conditions, and notices contained herein. Your use of the ANY LAB TEST NOW® Web Site constitutes your agreement to all such terms, conditions, and notices NOTICES AND PROCEDURE FOR MAKING CLAIMS OF COPYRIGHT INFRINGEMENT Pursuant to Title 17, United States Code, Section 512(c)(2), notifications of claimed copyright infringement under United States copyright law should be sent to Service Provider’s Designated Agent. ALL INQUIRIES NOT RELEVANT TO THE FOLLOWING PROCEDURE WILL RECEIVE NO RESPONSE. See Notice and Procedure for Making Claims of Copyright Infringement. COPYRIGHT AND TRADEMARK NOTICES: All contents of the ANY LAB TEST NOW® Web Site are: Copyright 2009 ANY LAB TEST NOW® and/or its suppliers. All rights reserved.